The other day I was talking to the Treasury Secretary at the Ministry of Finance who was a board member of the Export Development Board when I was Chairman of the EDB way back in 2005. Given his vast experience in the public sector I have always looked up to him for his words of wisdom. He mentioned something that really got me thinking. He said that in the public sector somebody comes along and for three years develops a particular entity and thereafter another person walks in and during the next three years destroys whatever was done. It’s sad but his analogy is right. When I look at Sri Lankan cricket today, I get a feeling that we are in an era of development given the structured basis through which the business is looked at. The recent victories experienced against the Australians and the signage that has sprouted at key roundabouts announce the ‘restage’ of brand Sri Lanka Cricket in my view. Now what is required is for every Sri Lankan to support the task ahead. The essence of brand cricket is excitement but it has a strong connection with every Sri Lankan which hinges on patriotism - being proud that we are Sri Lankan. This is essentially seen when the brand is featured in other markets but we saw this happening during the last two weeks in Sri Lanka following the team’s victories over Australia. The second element that has made this brand very powerful is the advertising expenditure directed towards it in the wake of the country’s 1996 World Cup win. This includes not only the sponsorship money that the team attracts but also player endorsements of private sector brands. If all this is valued, Brand Sri Lanka Cricket will be worth way above the IPL brand value of $ 4 billion in my view, but sadly no one has valued this most valuable Sri Lankan asset. Given the new management thinking, I feel that very soon we will see this business perspective coming into the system. 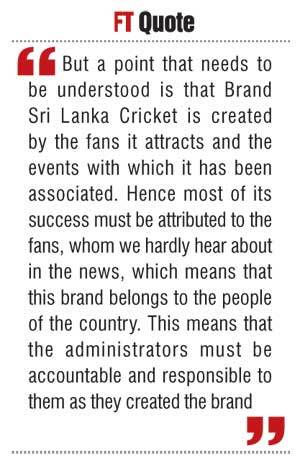 But a point that needs to be understood is that Brand Sri Lanka Cricket is created by the fans it attracts and the events with which it has been associated. Hence most of its success must be attributed to the fans, whom we hardly hear about in the news, which means that this brand belongs to the people of the country. This means that the administrators must be accountable and responsible to them as they created the brand. If we do a deep dive, the challenge for Brand Sri Lanka Cricket is to get a brand custodian who will calculate the brand value and understand the propositions that are wrapped around the brand. Thereafter, a clear brand development plan can be drafted, one which will focus on the promotional side as well as sharpen the identity as it evolves in the changing fashion of the game - be it the five-day, one-day or 20-over game - but more importantly safeguard the brand from activity that will devalue it. If I am to share a best practice from my experience - if one does a brand equity study on a brand like Dettol you will find the detailed architecture of the brand and what activities have added value to the core proposition of it being a disinfectant. The study will also identify what activities hurt the brand values that it possesses. This is the type of management science that Brand Sri Lanka Cricket requires, which is my take on the Cowdrey Lecture that Mr. Sangakkara very beautifully delivered some years back. Maybe it is worth revisiting the ideas shared that day, given the new management’s perspective on the game today. An important point to note is that if we take a typical brand like Signal for instance, the brand custodian can clearly mark out the values that brand must be wrapped in, for instance caring, aggressive but protective, just like the personality of a father at home. But in the case of Brand Sri Lanka Cricket, it’s the situations around it in the past regime that has resulted in the devaluing of the brand values on the name Sri Lanka Cricket. In other words the uncontrollable variables such as the political economy at play affected the brand drastically. However, it must be said that with careful planning even a difficult situation, such as the case of Brand Sri Lanka Cricket, could have been managed provided the there was strong leadership at that time. But the reality was that at that time it sadly lacked this calibre of talent on the administrative front. Let me take you back to the MCC Cowdrey Lecture at the Nursery Pavilion at Lord’s which was brilliantly delivered by the former cricket captain. I feel it is more relevant today given the restaging of the game that is taking shape. The ideas shared by Mr. Sangakkara can be held in parallel with the works of brand theorist Keller in the popular marketing theory Customer-Based Brand Equity Pyramid. Let me capture the essence of this idea. Sangakkara said: “Cricket in Sri Lanka is no longer just a sport: it is a shared passion that is a source of fun and a force for unity. It is a treasured sport that occupies a celebrated place in our society. It is remarkable that in a very short period an alien game has become our national obsession, played and followed with almost fanatical passion and love.” I guess the new management must understand the responsibility that they carry in their daily work. He went on to say that before Sri Lanka’s World Cup success “the leadership of Arjuna during this period was critical to our emergence as a global force. It was Arjuna who understood most clearly why we needed to break free from the shackles of our colonial past and forge a new identity, an identity forged exclusively from Sri Lankan values, an identity that fed from the passion, vibrancy and emotion of normal Sri Lankans. “From Matara came Sanath, a man from a humble background with an immense talent that was raw and without direction or refinement. A talent under the guidance of Arjuna that was harnessed to become one of the most destructive batting forces the game has ever known. It was talent never seen before and now with his retirement never to be seen again. Sangakkara said about the Lahore attack: “It is strange how clear your thinking is. I did not see my life flash by. There was no insane panic. ‘We are Sri Lankan,’ we thought to ourselves, ‘and we are tough and we will get through hardship and we will overcome because our spirit is strong’. This is what the world saw in our interviews immediately after the attack. We were calm, collected and rational. Our emotions held true to our role as unofficial ambassadors.” I guess this is the same spirit we need to drive public sector responsibility. The masterpiece of the MCC Cowdrey Lecture in my view was the first draft of Brand Sri Lanka Cricket. With the proactive current management it has the potential to become a formal document. But the real challenge is when it will come to play on the ground. (The author is an award-winning Marketer and business personality in Sri Lanka who is the Former Chairman of the Sri Lanka Export Development Board and Sri Lanka Tourism and currently heads the Rs. 35-billion government retail chain Lanka Sathosa).